This game puts place value and measures together! 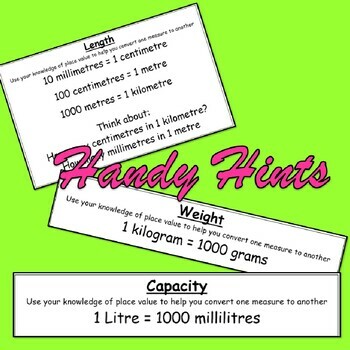 Using length, capacity and weight (millimetres, centimetres, metres and kilometres, grams and kilograms, millilitres and litres) children will be multiplying and dividing whole numbers and decimals by 10, 100 and 1000 into a "fast and furious" loop game to find the answers to a range of measures questions - converting from one measure to another and vice versa.. Every child is engaged throughout the whole game and with 45 cards, every child has at least one card - with some children having two or more cards! This allows a clear differentiation for children - with the more able having more cards with the more complex equations on them to really stretch their knowledge and embed the skills. 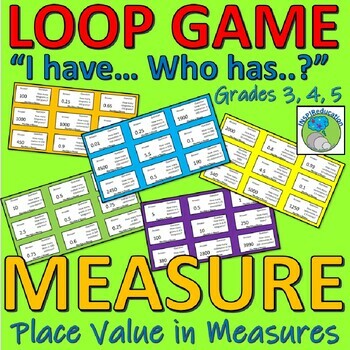 Used in our classrooms to embed the knowledge of place value in measure - our children love these Loop Games and we are sure that yours will too! 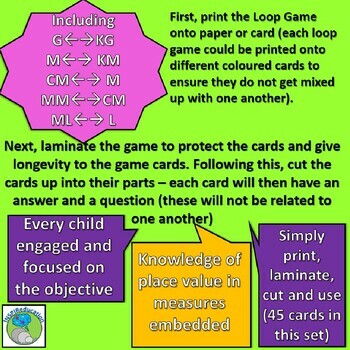 After purchasing and downloading, simply print off the Loop Game (you might find it useful to print onto coloured paper or card so that if you have more than one Loop Game, the cards don't get mixed up!). To keep the game fresher for longer, laminate, then cut up the cards. You are ready to introduce this amazing resources to your children! In addition to the game cards, you might want some children to have smaller white boards and pens to jot down the questions and work out the answers - but this depends on the level, needs and skills of the children in your group. Some of our children ask for these things as a support, they rarely use them but they feel more confident having them. One child starts by reading out the question on their card. The other children must work out the answer and see if that answer is the same one as on their card. If it is, they read out the next question on their card. Once again, the other children work out the answer and check to see if they have it on their card. The game finishes when every child has read out their question and all the answers have been used. As the game progresses, some answers may be on more than one card (for examples there are at least three 1000 answer cards) - this will lead to a loop within the Loop Game. The children must work out how to get every child to ask their question by reviewing the different variations of loops. This encourages problem solving, listening skills and finding an effective solution. Swap the cards after each game so that children do not remember who has which card and then remind their friends who is next! Time the children and record how long each game takes to complete - can they beat their time on every go? 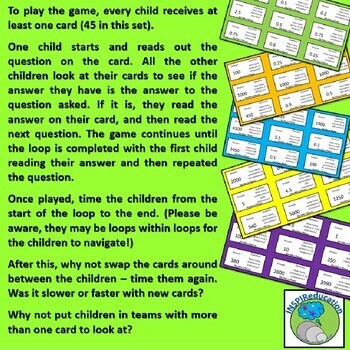 Put the children in teams with a set of cards to watch out for - how does this change the timing challenge? What is the most number of loops they can find within the game? We have found that the children in our classes also invent their own games, and want to add their own cards to extend the game. It is not unusual for our games to have more than 60 or 70 cards in each game, with the children having multiple cards each. They love the challenge, the speed, the fun and the different way of doing math revision! These Loop Games are linked to the four operations within Fractions, as well as equivalency within Fractions, Decimals and Percentages.